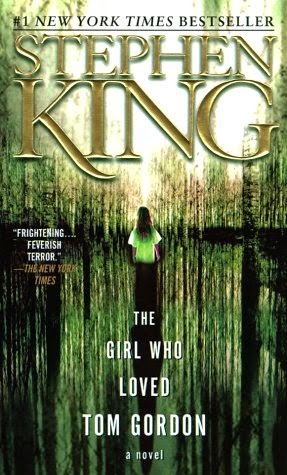 "The Girl Who Loved Tom Gordon" is another novel by King, in which a desperate fight for servival becomes the main theme. Trisha, a nine-year old girl gets lost in the woods of Maine during a hike with her mother and elder brother. She is put off by their constant arguments and decides to stay behind. Unfortunately for her, she walks of the trail and gets hopelessly lost in the thick woods. At first she doesn't realize how serious her problem is so she just pushes on, hoping to find her way out. However, the further she moves, the wilder the woods become. As her struggle to survive on her own in wild and inhospitable woods, her perception of reality gets distorted and she begins seeing... things. This style of describing inner fears and seemingly giving them form is something that King has used before to a very good effect. In case of this novel it works quite well too. The only part I didn't like so much was how Trisha's inner monologues were presented. Her thoughts wandered aimlessly and she touched on random more or less important issues connected with her life. However, the mature language she uses doesn't lend these sections as much credibility as I'd like to see. Obviously, she is feverish, almost delirious and is not really aware of what she's thinking about and saying out aloud. Still, I think the novel would benefit from using a more juvenile language in these fragments. It is a relatively short novel (at least for King's standards) and the tale is nicely wrapped up without needless pomposity and drama. The descriptions of forest make it feel like an almost magical, but also a dangerous and dark place. I'm not a baseball aficionado, so any references to this sport were pretty much lost on me. That's not to say these are essential for appreciating the story but I'm sure fans of this sport would find the narrative all the richer for those bits.